Before the summer we started the project “KTH Profiles” with the focus to extract the current profiles from “KTH Social” and create a new, standalone application (called KTH Profiles) with extended functionality and improved ways to maintain and develop the new profiles in the future. The previous profile pages was maintained by the E-learning object due to the fact that KTH Social lies within their responsibility and the profiles were included in that application. This was not good because the profiles are not related to e-learning. Also, the KTH Social application is big so a decision was made to move the responsibility and the functionality to the “Web object”, which has the overall responsibility for web communication and outreach. The first step was to collect all the information we needed to start the development in our new technical framework we use (Node templates). We built all the basic functionality needed to display a profile and a way to continuously import data for our users to to keep them up to date with the basic information form our central users and groups system (UG). With that in places we started to implement new functionality that had been requested from our users for quite some time. 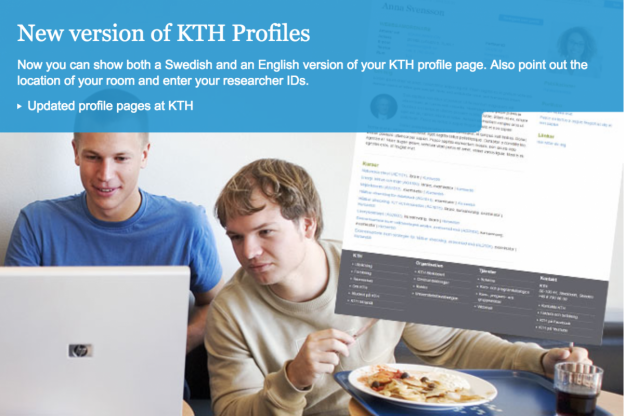 Before the new KTH Profiles was released we needed to import user generated content from the KTH Social profiles including texts, files and images. The new UG import had to be started and we needed to synchronize the release with the E-learning object to make sure the old profiles were removed at the same time. On top of the new and improved functionality, we now have a better and more efficient way to maintain and improve the profiles. The E-learning object can focus on e-learning and the Web object can take care of the business needs regarding the new KTH Profiles. The system dependencies are also improved which will result in less down time during releases due to the fact that we have decoupled the profiles form KTH Social. At last, thanks to all people who has contributed to the project in one way or another.